This fall, the Center for Art, Design and Visual Culture (CADVC), celebrates the launch of four significant projects by research professor Maurice Berger, who through his curatorial work frequently explores issues of race, society, and culture, examining difficult subjects through the lens of art, photography, and visual media. 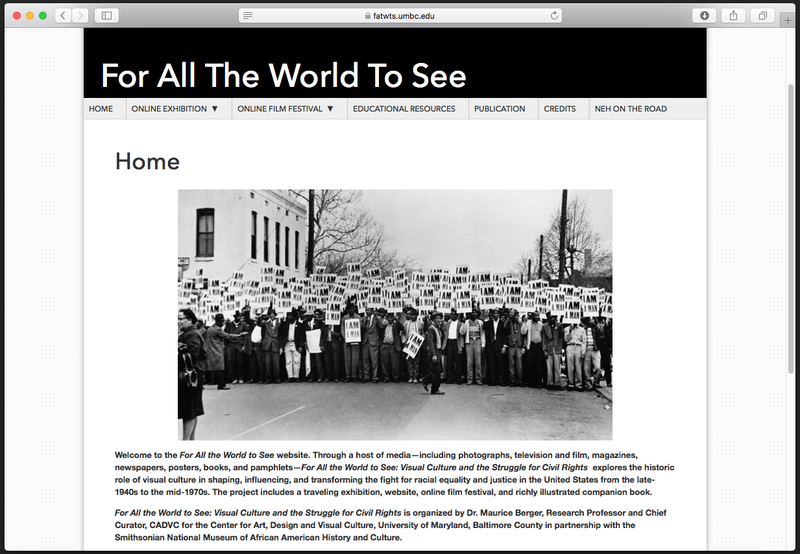 The new projects include the unveiling of exhibition websites for For All the World To See: Visual Culture and the Struggle for Civil Rights and Revolution of the Eye: Modern Art and the Birth of American Television, the creation of a online home for Berger’s “Race Stories” essays, and the extension of a national tour of For All the World To See through the National Endowment for the Humanities’ On the Road program — all of which will broaden public access to this research. “I have a lot of faith in visual media to communicate powerful and even life-changing ideas about this country,” says Berger, whose previous work includes exhibitions such as Notes in Time: Leon Golub and Nancy Spero (1995), Adrian Piper: A Retrospective (1999); Fred Wilson: Objects and Installations 1979–2000 (2002); White: Whiteness and Race in Contemporary Art (2003); For All the World To See: Visual Culture and the Struggle for Civil Rights (2012, photo above); and Revolution of the Eye: Modern Art and the Birth of American Television (2016). Since 2012, Berger has contributed monthly “Race Stories” essays for the Lens Blog of The New York Times, exploring the relationship of race to photographic portrayals of race, and complementing many of the issues explored in his curatorial work. 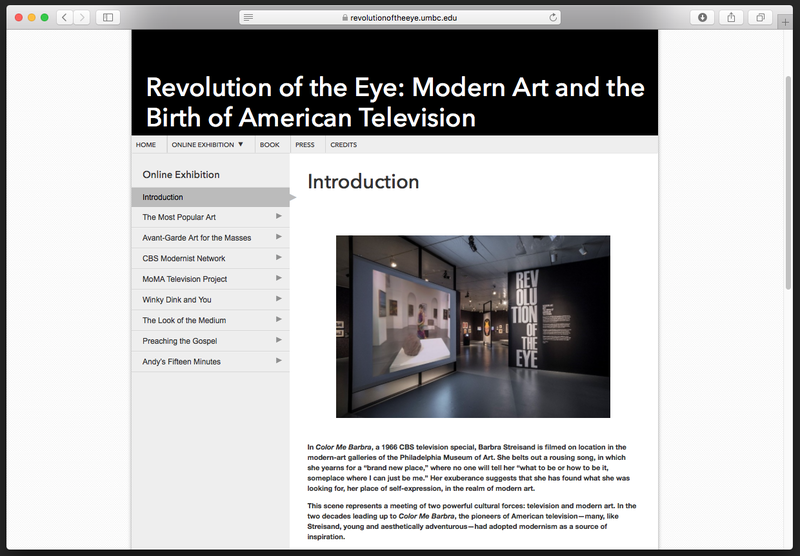 The online version of the exhibition Revolution of the Eye: Modern Art and the Birth of American Television, which toured nationally from 2015 to 2017 and was co-organized by CADVC and the Jewish Museum in New York, explores how modern art served as an influence and a model for shaping the new medium, from the 1940s to the 1970s. Visit the site here. 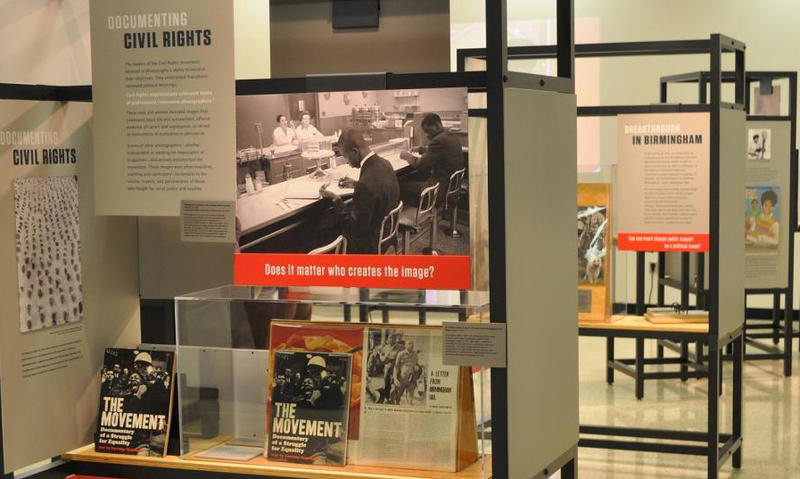 For All the World to See: Visual Culture and the Struggle for Civil Rights, co-organized by CADVC and the Smithsonian National Museum of African American History and Culture, opened in 2010 and continues to travel in a smaller, lower-security version through the NEH on the Road initiative. The exhibition was the first to comprehensively explore the historic role of visual culture in shaping, influencing, and transforming the fight for racial equality and justice in the United States from the late-1940s to the mid-1970s. Visit the new online version of the critically acclaimed exhibition here. 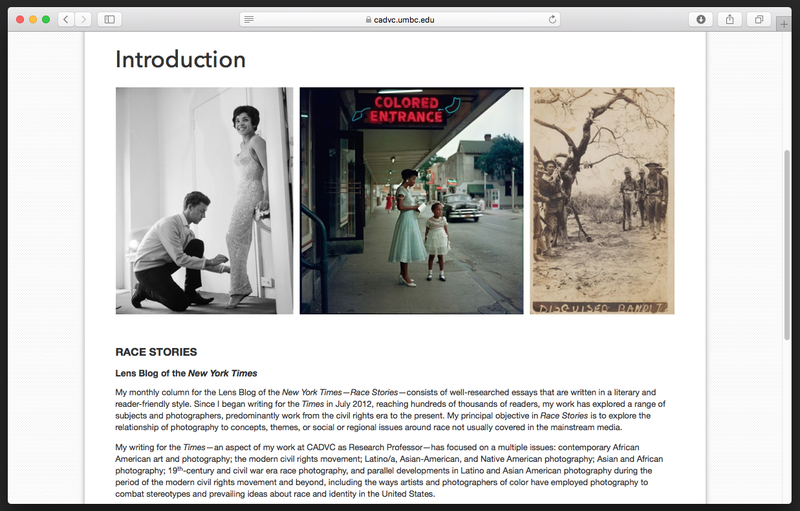 The launch of the Race Stories webpage brings together in one convenient place links to Berger’s monthly “Race Stories” column, which explores the relationship of photography to concepts, themes, or social or regional issues around race not usually covered in the mainstream media. Visit the site here. After a successful national tour, the exhibition For All the World To See: Visual Culture and the Struggle for Civil Rights received support from the On the Road program of the National Endowment for the Humanities, providing the opportunity for it to continue to tour the country in a reduced format. NEH on the Road is designed to create wider national access to the ideas, themes, and stories explored in major exhibitions funded by the National Endowment for the Humanities. Recently, the NEH extended its support of For All the World To See through 2023, the first time the endowment has doubled the national tour of an exhibition, allowing travel to an additional 47 geographically diverse national venues through 2023. Information on the NEH On the Road version of For All the World To See is available here.